It wasnt going to take long before we got the right image floating the internets. Here it is, and it’s cute. It is almost common knowledge that the Galaxy Note II design was going to take from the Galaxy S III, so the only thing one would be unsure of is if there would be extra fine tuning of the finished design, or the final outward size. And now we have it here, just look at it and see how close it is in appearance to the Galaxy S III, including the home button, the Marble white colour, I wouldn’t be surprised to see pebble blue, garnet red and black versions show up at launch. One thing I would ask you to check is, notice how thin the bezel is? What we wouldn’t get from the leaks unless it’s from a hands-on leak would be the final specifications on the device. But what we have so far makes it an object of desire for many, and judging from the way Galaxy Note was received globally, this one is a perfoemer out of the box. 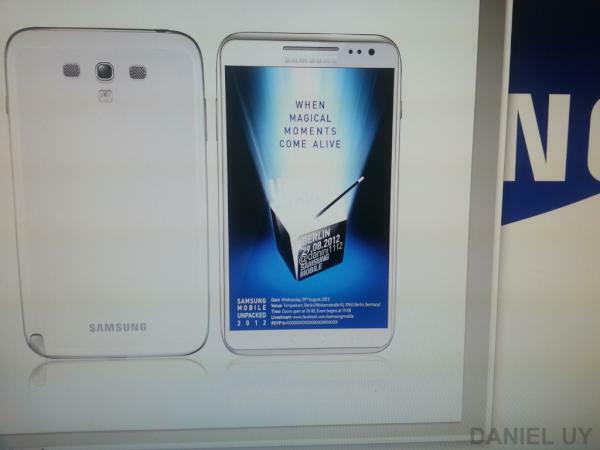 We look forward to seeing some Exynos Quad Core goodness, 2gb RAM and the well known 5.5″. What this image and other leaks don’t tell us is whether there will be any flexible display or battery within. 2 weeks isn’t far away now is it? And something worth pondering is what the impact of Samsung launching a device on 29th, Apple launching a competitor a week later, same as Nokia, Sony and LG. This will be one hell of an end to the quarter, with OEMs outdoing each other as to who gets their devices faster in the market before the other and who ships more before Q1 of next year. A very important season this one, right? Now we know..Incredibly thin this! Only some tissue paper difference with the SIII if any..No prizes for flagship features of the SIII to come over to the note.Like Smart stay,S voice,Smart alert,best photo etc. What a quarter this is! Yeah, one would expect those features to show up on the Note II, remember the pop up play already exists on the Galaxy Note 10.1 which is also a Quad Core Exynos.